Net sales increased by 36 per cent to SEK 556 (407) m while gross profit increased by 47 per cent to SEK 335 (228) m with a larger property portfolio and milder winter. Profit before tax amounted to SEK 458 (492) m. Profit after tax was SEK 113 (406) m, or SEK 0.80 (3.00) per share. The profit decrease is mainly due to provisioning for tax costs and lower profits from Hemsö, which reported lower unrealised value changes on properties. Cash flow from operating activities was SEK 120 (37) m.
Profit for calculating dividends for the period was SEK 121 (78) m, equivalent to SEK 0.90 (0.60) per share. As of 31 March 2012, the property portfolio consisted of 317 (324) properties with a book value of SEK 15,533 (15,693) m.
In April, the estimated profit for calculating dividends for the full year 2012 was downgraded to SEK 550 m, from SEK 600 m previously after negative outcomes on two tax rulings were received. This estimate corresponds to SEK 4.00 (4.40) per share. From 1 January 2012, the portfolio in Hemsö Fastighets AB is recognised according to the equity method. Compared to the proportional method, the results of operations and financial position from the holding in Hemsö are reported on an individual line instead of, in principle, affecting all other items, more information at www.kungsleden.se/consolidation-of-hemso. Kungsleden sold 7 (2) properties for SEK 230 (5) m, generating a profit of SEK 20 (3) m. These sales affected profit for calculating dividends by SEK 39 (3) m. No properties were purchased, compared to 37 properties, for SEK 3,748 m in the corresponding period of 2011. Kungsleden’s syndicated loan was rearranged with a new SEK 4,500 m facility in January. 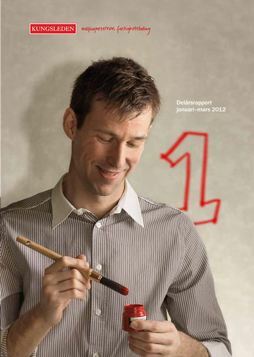 Kungsleden came second in the Great Place to Work Survey 2012 out of medium-sized organizations in Sweden. Two tax rulings from the Administrative Court of Appeal, with a negative outcome for Kungsleden, were received in April. As a result, profit for calculating dividends was charged with SEK 80 m and the Income Statement with a tax cost of SEK 260 m.
Basically all the remaining refinancing requirement for 2012 was secured in April. Loans of SEK 1.6 billion were extended, of which SEK 1.0 billion to 2015 and SEK 0.6 billion to 2013. Definitive tenders were also secured for loans of SEK 1.3 billion. “Results for the quarter Net sales increased by 36 per cent to SEK 556 m, while gross profit increased by 47 per cent to SEK 335 m, compared to the first quarter of the previous year. After the transfer to reporting Hemsö in accordance with the equity method, net sales and gross profit include Kungsleden’s wholly owned properties only. Instead, Hemsö’s profit or loss is reported on its own line in the Income Statement, at half of Hemsö’s profit after tax. Hemsö’s profits decreased by 44 per cent to SEK 84 m, mainly a result of lower unrealised value changes on properties. Sales and administration costs were up by just over SEK 11 m, mainly as a consequence of a larger property portfolio. A larger portfolio means more borrowings, which were charged to net financial items. But increased costs were more than compensated by gross profit increasing by SEK 107 m, with most of the increase provided by the properties purchased from NR Nordic & Russia Properties. Property sales produced a profit of SEK 20 m net. I’m very satisfied with our results and the stability of our underlying operations. A mild winter early in the year helped the earnings capacity of our portfolio to increase by 8.0 per cent, from 7.9 per cent at year-end. The operating surplus margin increased from 66.7 per cent to 67.2 per cent. Profit for calculating dividends was SEK 121 m, compared to SEK 78 m last year despite unexpected tax costs, with a SEK –80 m liquidity effect, after rulings by the Administrative Court of Appeal in Stockholm. Retroactive tax The rulings are for two companies in the group, which in 2004 claimed deductions for losses on liquidation when liquidating limited partnerships. These losses arose as part of internal restructuring, and accordingly, the Administrative Court of Appeal did not regard them as actual from a group perspective. Rulings in various administrative courts of appeal on the same legal issue—to which Kungsleden was not party—have differed in the past year. Our view is that we have consistently followed the rules on each occasion, and against this background, we intend to have this matter considered at the highest level. It is regrettable and very frustrating to be unable to offer clearer information after eight years. Nordic Modular and Hemsö Nordic Modular made a good start to the year. Sales of modules increased by 18 per cent, with an upturn also apparent in lettings. Hemsö’s operating net also made positive progress. I can conclude that the interest in public properties remains high, and at present, we see no risk of increased required returns in this segment. For Kungsleden’s part, the lettings market featured higher activity with more terminations, but also more new contract signings. In like-for-like portfolio terms, net lettings were virtually unchanged, but were higher in absolute terms, for reasons including us now holding a larger portfolio. When companies see a need to adapt their premises, they start earlier now than pre-financial crisis. Our mission is to maintain unchanged, and preferably reduced, vacancies. Funding In the period until the start of the second quarter, we had rearranged and secured definitive tenders on basically all our refinancing requirement for 2012. This means that we have new credit and loan facilities totalling SEK 7.4 billion. Average interest after arranged refinancing is estimated at 6.7 per cent. The previous facilities were entered a few years ago when loan terms were more advantageous. The interest margins received are consistent with what the rest of the market is paying. We will continue to work to limit our funding costs and diversify our loan portfolio through alternative funding sources, such as unsecured bonds. Outlook Our business is progressing very stably, and our average property yield increased to 8.0 per cent in the quarter. We also did some positive transactions, but the tax rulings for the 2004 tax year arrived in April. Overall this meant the downgrade of the Board of Directors’ estimate for profit for calculating dividends, which was reported earlier in April, was limited to SEK 50 m. The estimate for the full year is SEK 550 m, against SEK 600 m previously. Kungsleden AB (publ) discloses the information in this press release according to the Swedish Securities Markets Act and/or the Swedish Financial Trading Act. The information was provided for public release on 26 April 2012 at 8:00 a.m.